This downsized ElaZtech swimbait delivers the incredible softness, swimming action, and 10X Tough durability of its larger brethren in a smaller package. Featuring Z-Man's exclusive curved paddle tail, its small size is ideal for crappie and white bass, but really shines when largemouth and smallmouth are keyed in on smaller forage. 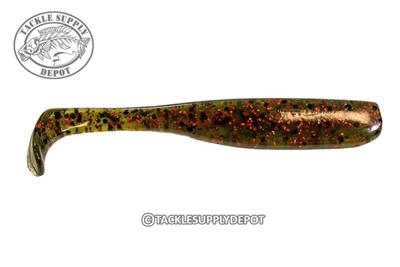 The Slim SwimZ is also an ideal saltwater bait when seatrout and redfish are feeding on small glass minnows and fry. DISCLAIMER * Do Not mix ElaZtech * baits with standard plastic baits. These look amazing, and would be great on a VMC mooneye jighead. Super strechy and durable. would prefer a bigger size like 4-5 inch range.